You get the best of both worlds in Chalet Hotel de Verbier, a traditional style property with lots of alpine charm and high standards of comfort, food and space. The Chalet Hotel has an excellent location bang in the centre of town with direct access to all the bars, shops, restaurants, hire shops and transport links. It’s walk up a hill to get to the main ski lift, about 400 meters uphill to Medran but compared to many properties in Verbier; even the ones the rich and famous own, you’ll be better located than them. At the end of the day the 400 meters is a stroll down hill, the perfect cool down after skiing the best slopes in the world and you’ll go past a few classy bars on the way. Chalet Hotel de Verbier is opposite the Hotel Farinet which has the popular Farinet Lounge Bar. Après ski here cannot be beaten with live music and extensive cocktail menu. It’s increasingly hard to get into Swiss ski resorts at a good price, Chalet Hotel de Verbier offers this and I recommend everyone to go to Verbier at least once in their lives. 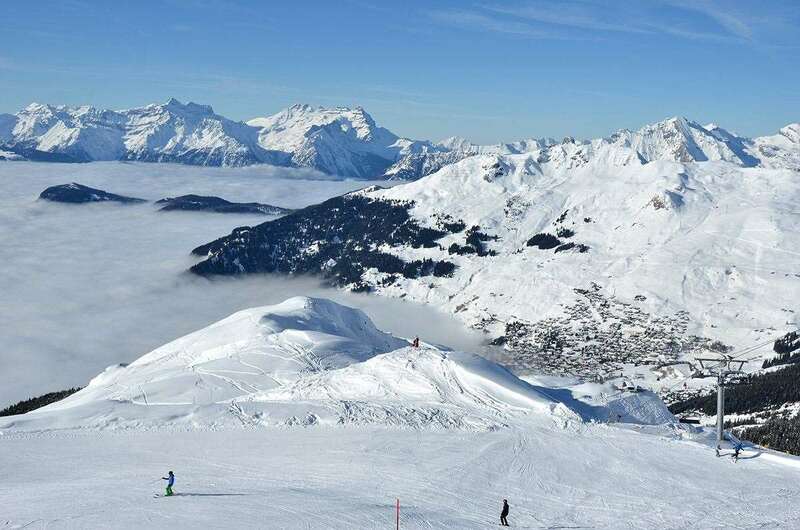 Conveniently located on the "Place Centrale," Chalet Hotel de Verbier provides a superb base from which to explore Verbier and the spectacular "4 Valleys" ski area. The Medran gondolas, which provide the main access from the centre of the resort up to Les Ruinettes and on to La Chaux and Mont Fort, are less than 5 minutes' walk away. Alternatively, take the ski bus which stops just 50m from the hotel. The hotel's public areas are furnished in an attractively rustic Swiss style and provides a warm and welcoming atmosphere, with a comfortable and spacious lounge with log fire, where afternoon tea and cake is served daily, and adjoining bar with TV. Your buffet breakfast and 5 course evening meal with choice of complimentary wines, is enjoyed in a separate traditionally-styled dining room. All the bedrooms are to a high standard in a modern style and have private bath or shower/wc, and many also have balcony. Some rooms on the 3rd floor are under the eaves and have beamed ceilings adding to their rustic charm. Family suites with two interconnecting twins are available for up to 5 persons with an extra bed. Ever wanted to improve your skiing? Then spend a week with us. All bedrooms with private en suite facilities, cable TV and hairdryer, many also with balcony. Some rooms on the 3rd floor are under the eaves and have beamed ceilings adding to their rustic charm. All the communal areas offer free WI-FI and there is a lift for your convenience. Room 64 (sleeps 2-5*) - Family suite (2 interconnected twin rooms with shared bath/wc), and balcony. The first good thing about this holiday was that we flew in and out of Geneva, a great terminal with plenty of room and good facilities. Transfer was a painless experience and the Chalet Hotel Verbier was one of the best we've stayed in. The food was very good, as was the wine with the meals. The practice of seating you at a different table with different people each night for dinner meant we got to know most of the other residents. I guess the only minor downside was that the Hotel location right in the centre of the town meant that you had to catch the ski bus to and from the lifts. Not a serious problem though. Our family room (54/55) had a balcony which caught the afternoon sun and we did actually get some sun, as well as some fresh snow. Plenty of scope in Verbier for a week of intermediate skiing. From Mary the GM right through all the staff, we were incredibly impressed at the level of attentiveness and efficiency. The food in the hotel was excellent, and getting to know other guests at dins was really good fun. Rooms are clean and comfortable. All in all, this was the best value ski week I think I have ever had. Couldn't recommend this hotel more highly.